Scaliscro Estate, a spectacular mixed sporting estate near Uig, Isle of Lewis, is for sale at a guide price of 2,500,000. 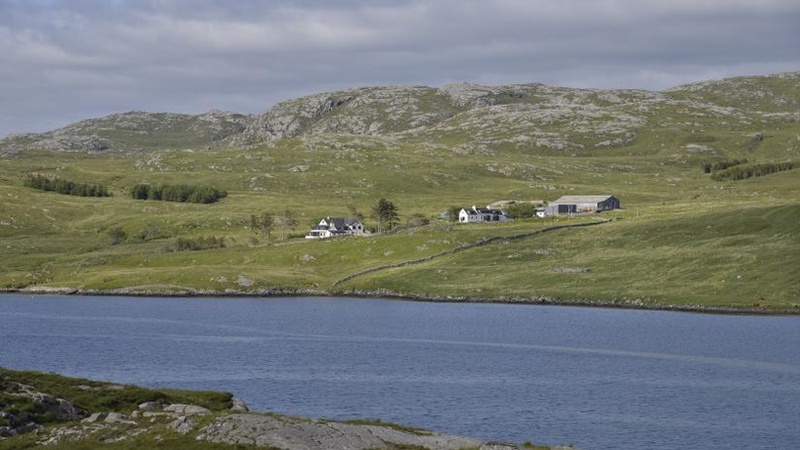 Extending to about 5,570 acres in total, this lovely property is situated in a beautiful setting on the west coast of the Isle of Lewis, on the shores of Little Loch Roag. Scaliscro is a wonderful Hebridean sporting estate and offers the privilege of obtaining a legendary Macnab'. In addition to red deer stalking, there is grouse, woodcock and snipe shooting, as well as salmon, sea-trout and brown trout fishing. The seller also owns the area to the north and east, extending to about 5,000 acres. This area is subject to common grazing rights and will be retained by the seller who will grant the purchaser of the estate an exclusive sporting lease for 175 years for a peppercorn rent. It is very rare to come across a coastal estate anywhere in Scotland which combines this variety of sport with a privately positioned lodge overlooking the sea. The challenging terrain amidst dramatic scenery provides the perfect backdrop for truly wild walked up sport for grouse, snipe and woodcock. The deep peat hags also provide exciting stalking ground. With around three miles of coastline, the estate offers access to good sea fishing, lobster potting and of course wonderful sailing. There are also excellent opportunities for salmon, sea-trout and brown trout fishing on a number of beautiful lochs making Scaliscro a really great all-round estate. Scaliscro Lodge is approached via a two-mile private road. Overlooking the loch, and situated on an elevated site well within the estate, the lodge offers breathtaking views of the hills of Uig and Harris. In addition, there is a row of three inter-connected cottages which are currently used as a single house. There are also useful outbuildings, including a large portal framed shed providing essential indoor storage, stock housing or workspace. There is also potential for a small hydro scheme. Below the lodge is a jetty/slipway, and there is another slipway at the head of Little Loch Roag. It is possible to waterski and sail in the loch, or to venture further out to sea by RIB or yacht from moorings directly below the lodge. Scaliscro Estate is for sale at a guide price of 2,500,000.